Scotch & Soda wants to create space for serendipitous city finds: The beautiful encounters that can only happen when you let yourself get lost. With a handful of well-known creatives enlisted as Scotch & Soda’s trusted ‘Misguiders’, the Misguiding Guide of Amsterdam seeks to unearth a side to the city you can’t mouse click to – and help us roam the ‘ungoogleable’. The Misguiders are all renowned influentials in their respective fields of music, style, business and art. Scotch & Soda will find out how to get lost with the help of Casper Reinders (entrepreneur), Joep Beving (composer and pianist) Mo Anwar (editor Vogue Arabia and Vogue Man NL), Niek Pulles (designer), Marc de Groot (photographer), Irena Ruben (make-up artist), Hester Wernert-Rijn (hairstylist and founder Mogeen), Cata Pirata (front woman of band Skip&Die), Susan Meinen (Head of Print, Scotch & Soda) and Carly Renwarin (Head of Marketing & PR Paradiso). Scotch & Soda’s club of ‘Misguider’ friends each take a wander of Amsterdam with journalist Fiona Hering and visual artist Jan Rothuizen (‘The Soft Atlas of Amsterdam’). En route, Jan and Fiona collect a sample of Amsterdam ‘un-tips’ from the Misguiders. These are transformed into conversational interviews and maps with a difference: Jan redraws Amsterdam; adding in his own personal, ungoogleable vision as he does. Photographer Mounir Raji captured the Misguiders in their different neighbourhoods for the first edition of the Misguide. The first edition will be available as a beautiful newspaper-zine in Scotch & Soda stores globally, as of mid October. 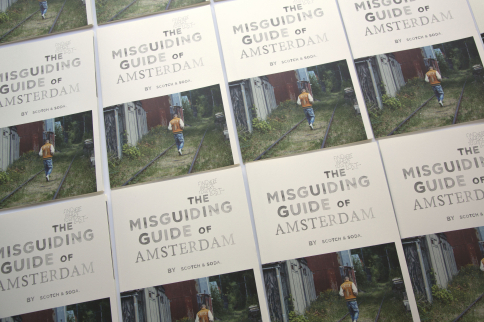 Amsterdammers can also get their hands on the Misguide in many of the locations within the newspaper – such as cafes, restaurants and hotels. The Misguide will also appear as part of the brand’s mobile app. The app enables the audience to shop all the Scotch & Soda looks worn by the Amsterdam Misguiders as well as navigate the Misguide via neighbourhood maps or by Misguider. The audience can also zone in on their favourite ‘un-tips’.